It’s the Sunday before Thanksgiving and you know what that means: Football! The leaves are changing, the weather is cooling and Thursday Night Football is just around the corner — oh wait, TNF has already been ruined by the season-long amateur production from NFL Network — okay, strike that last one. But still, the season is starting to take shape and the and the losers and winners are becoming more defined. If your team is on either end of the spectrum, it’s time to toast to next year or to celebrate the impending playoffs. 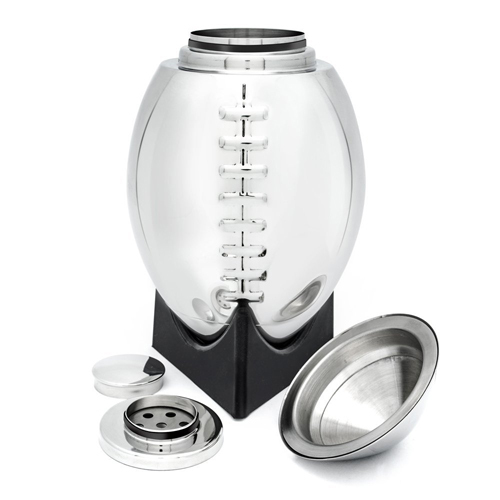 Either way the Stone Cask Football Cocktail Shaker is here to help. The stainless steel shaker holds 24 ounces and even comes with a presentation stand (aka a tee). And if your team is stuck in the middle and in the hunt, well, it’s still okay to partake — especially if you insist on torturing yourself by watching the terrible telecast that is Thursday Night Football.